Hello! Any snow out there yet? None here. It doesn't look like there will be a white Christmas this year. But there is a glitter everywhere in my craft room! 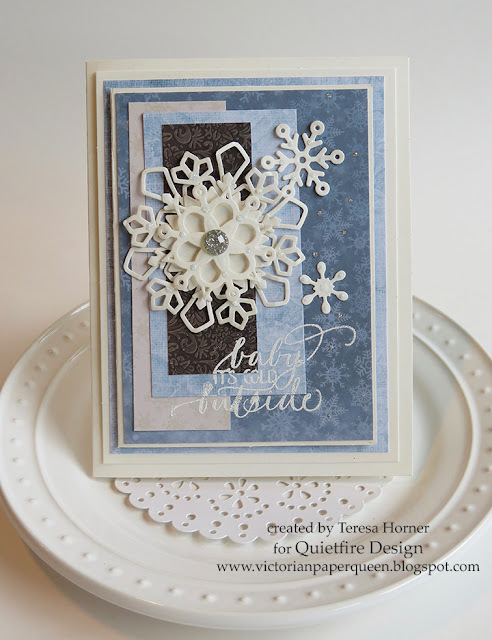 To make this card, I used the release sheet of Elizabeth Craft Design's Double Sided Adhesive to make a mask of a Snowflake Sky die by Our Daily Bread Designs. 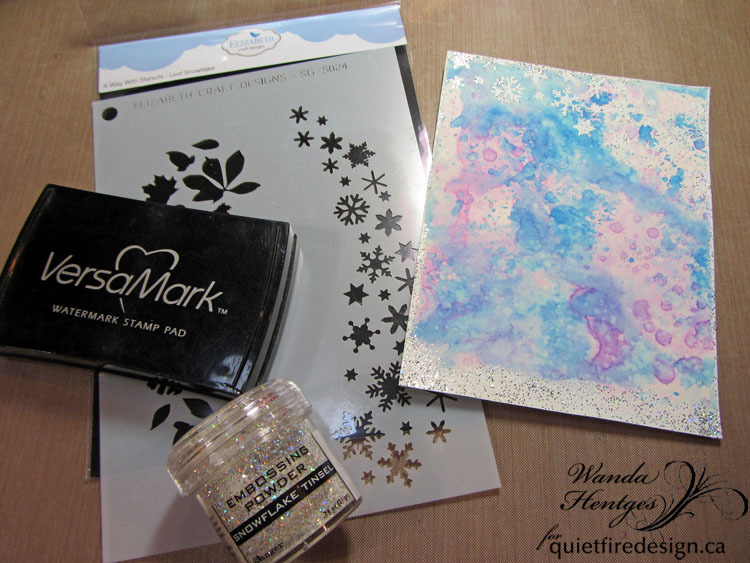 I used blue glitter all of the background and then added the clear diamond glitter after removing the mask. To add my quote, I stamped with black Staz-On ink on vellum. I also added some shiny blue washi tape near the edges of the vellum after I cut out a fish tail on the bottom. Otherwise, the vellum just seem to blend into the background. It was also a great way to hide some adhesive! Thanks for looking and stay warm! 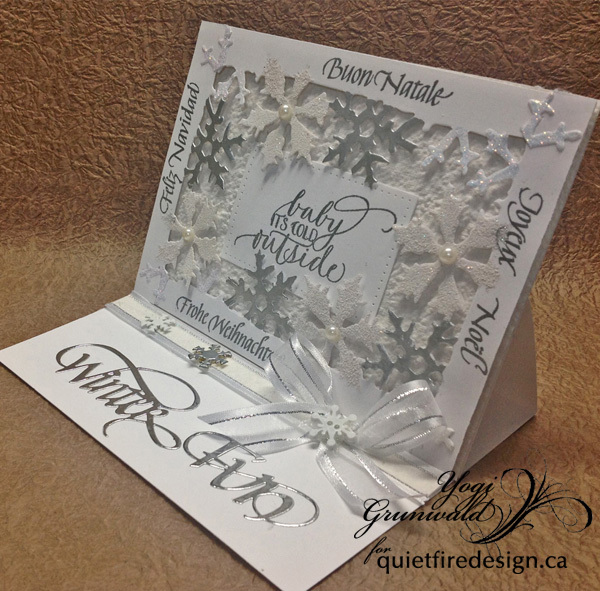 Yvonne here with a Quietfire Design Christmas card. I can't believe how time flies....only 4 weeks to go to Christmas! For today's card I used Quietfire Design Christmas stamp "Christmas Eve was a Night of Song". With a sentiment this beautiful one does not need a lot more than a gorgeous die-cut to frame it. 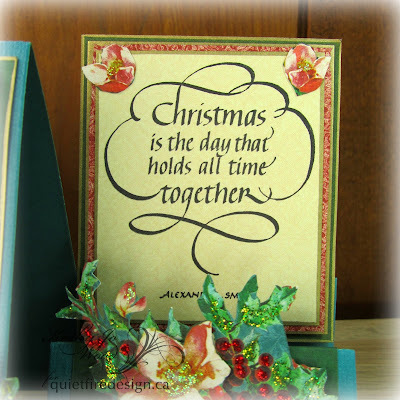 and wishing you happy Christmas crafting! Hi Everyone and Happy Thanksgiving if you are in the US with us today and stopping by.... Today i have lots of cards to share with you to get you all inspired for all those holiday cards you will be sending out soon! 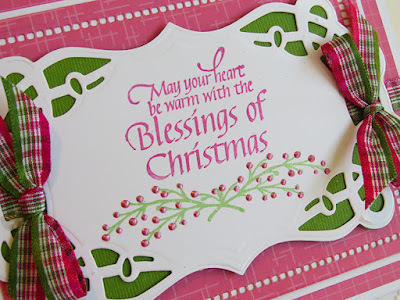 My first card up above is from the brand new release from Quietfire Design called May your Heart be warm and since my inspiration came from the ribbons i had in my stash i went with non traditional colors and did a pretty card in pinks and greens. 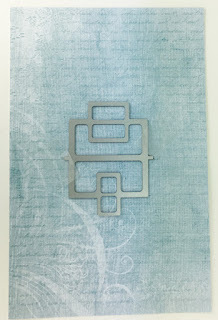 The dies are from Becca Feeken's newest die release too and i think they give the stamp a very special charm. 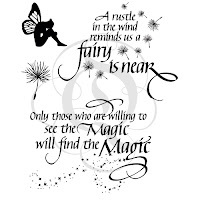 Not to mention the saying is beautiful too!! 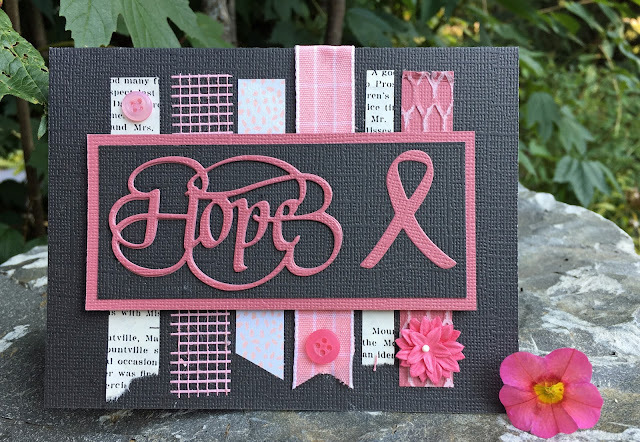 The little spray is on the bottom of the stamp and i thought i would use some pink liquid pearls to accentuate them and match with the ribbons... it's really pretty i think and i know exactly who i am going to send this one to. 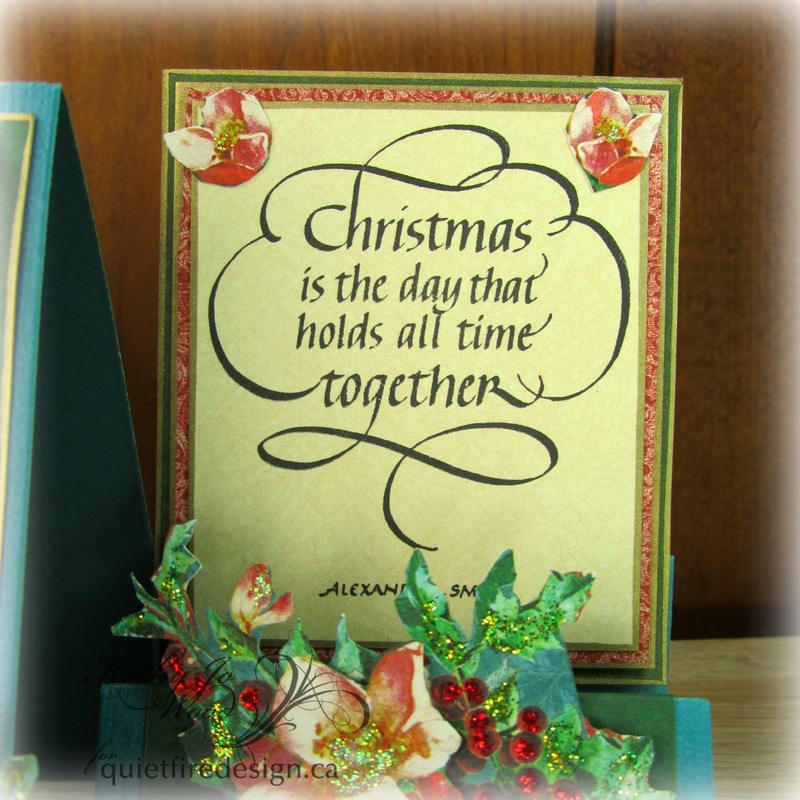 And this card i made with the new "Way with Words Christmas collection stamps" from Quietfire. This set has lots of adorable and sweet sentiments that you can use for years to come... Love the snowflakes. I went ahead and posted the set so that you can see all of them together and what a great set it is. 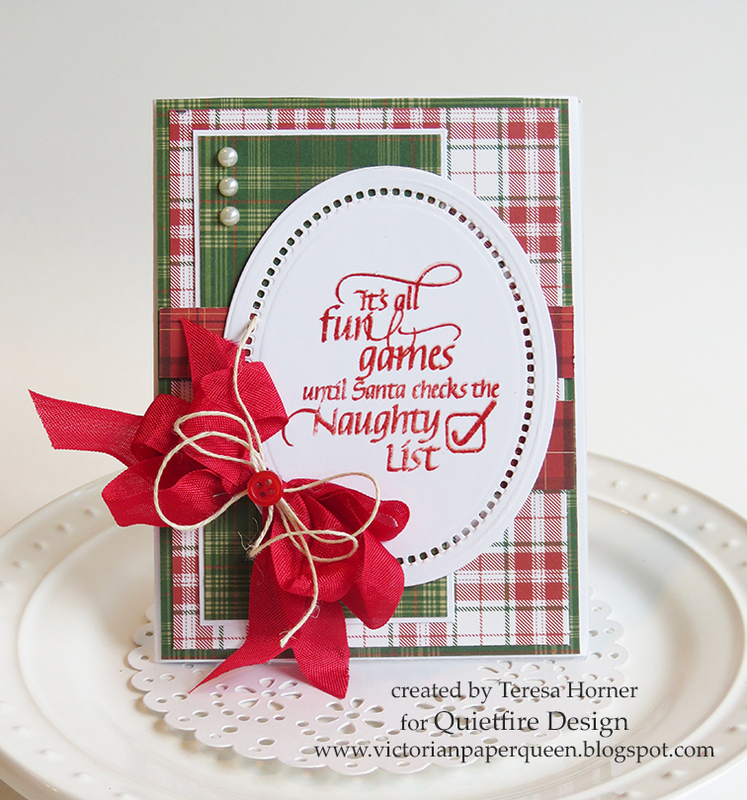 My next card i went with Santa themed plaid papers and created this cute card to send to a friend to make her laugh. 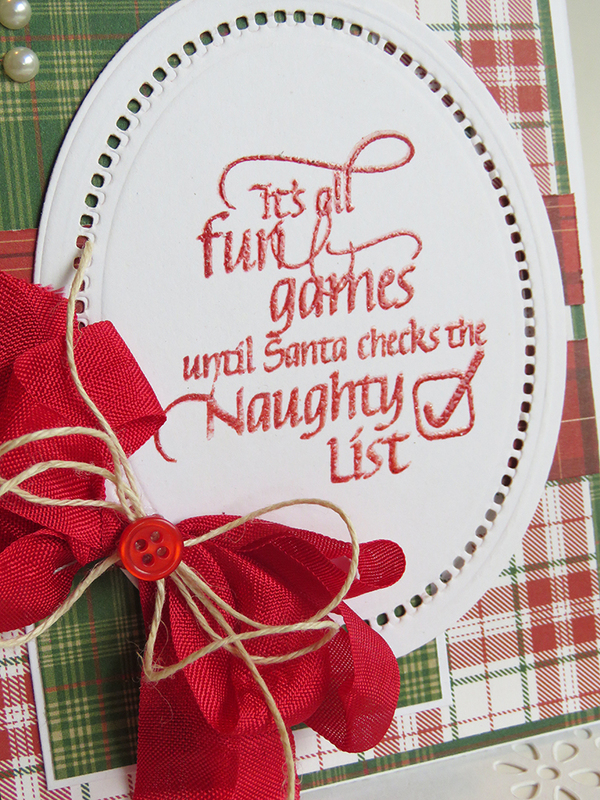 I even stamped in a bright Santa red ink and a pretty bow to match in red. 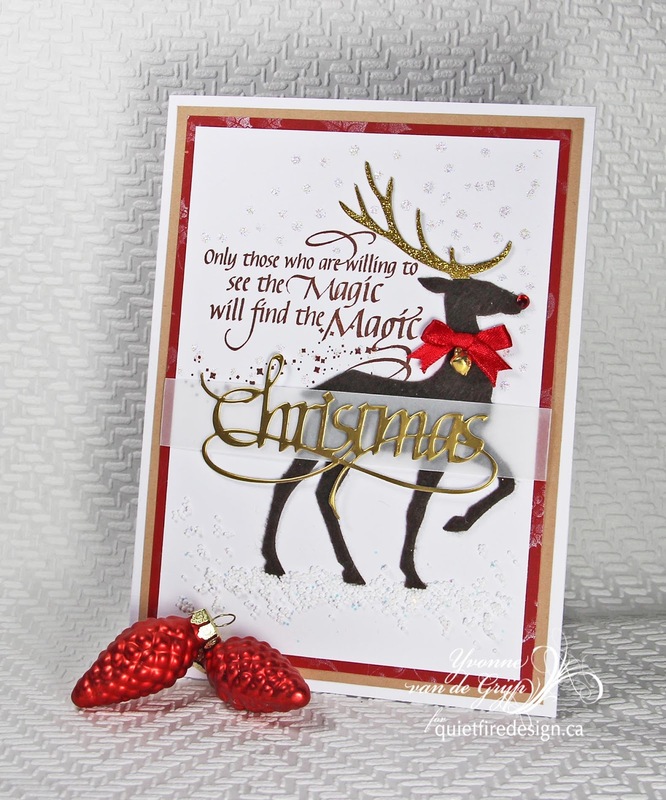 Thanks so much for stopping over today and be sure and stop over to the Quietfire store and see all the other Christmas stamps to do your cards this year!! Hi there! It's Suzanne here today. It might not be the first thing that "pops" into your head, but it does in mine! 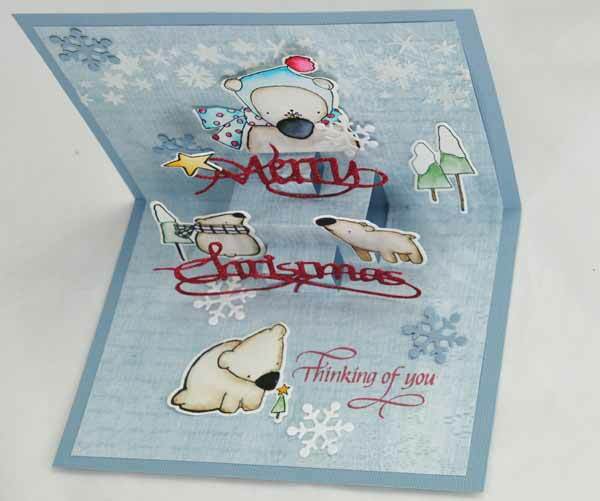 Let's use A Way With Words diecuts on a pop up card! 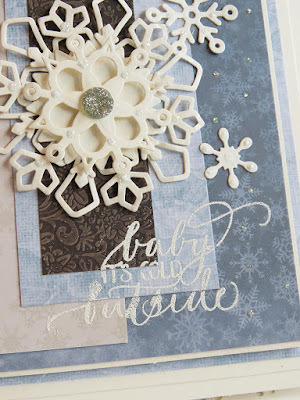 This month's Designer Challenge at Elizabeth Craft Designs was to use their General Pop Ups dies. I fell in love with these whimsical Winter Bears and knew they'd make a fun Christmas card surrounding A Way With Words diecuts! For today's challenge, Elizabeth Craft Designs will be giving away a $20 Gift Card to use on their website to 3 lucky winners. 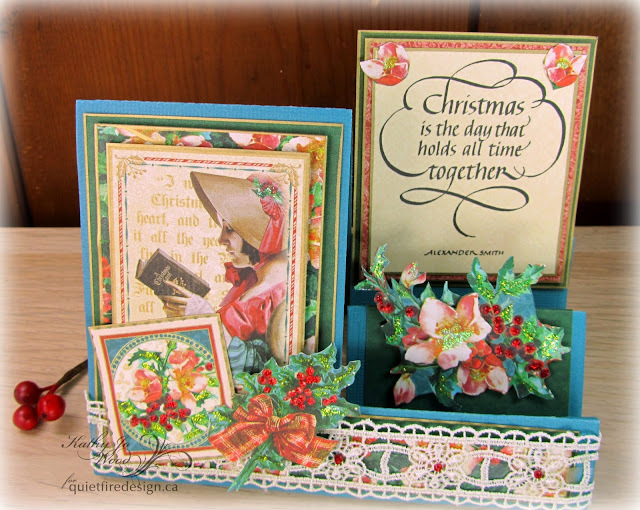 To enter, simply leave a comment on the Elizabeth Craft Designs Challenge Blog Post! Good luck! 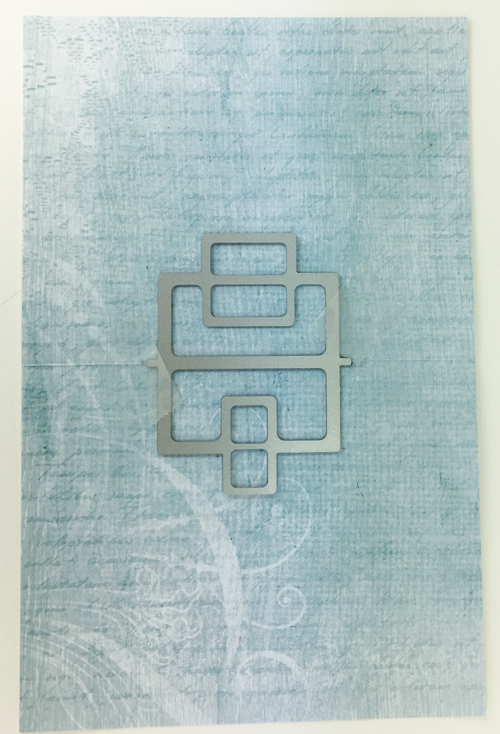 Form a tent fold card base measuring 6 x 4.5" from blue cardstock. 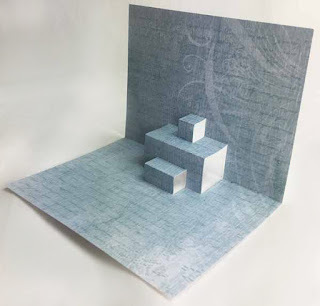 Cut a rectangle of patterned cardstock measuring 5.5 x 8.5". Fold in half. Place pop up die centered along the fold line (secured with a small piece of removable tape) and die cut. Fold and reverse-fold the score lines as shown in the photo. 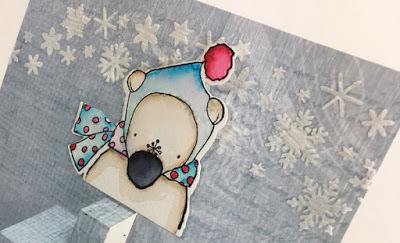 Stamp the bears on watercolour paper (I used my MISTI - my Tim Holtz Stamp Platform was occupied!) using black ink. 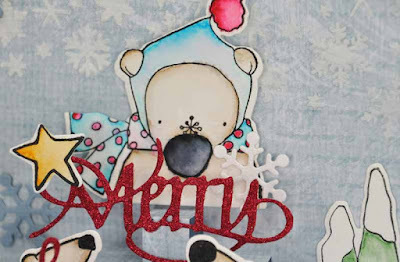 Designer Tip: Since stamping on watercolour paper can sometimes be a bit tricky, using a stamp platform allows you to easily and accurately register a second (and maybe third!) impression. Allow the images to dry. 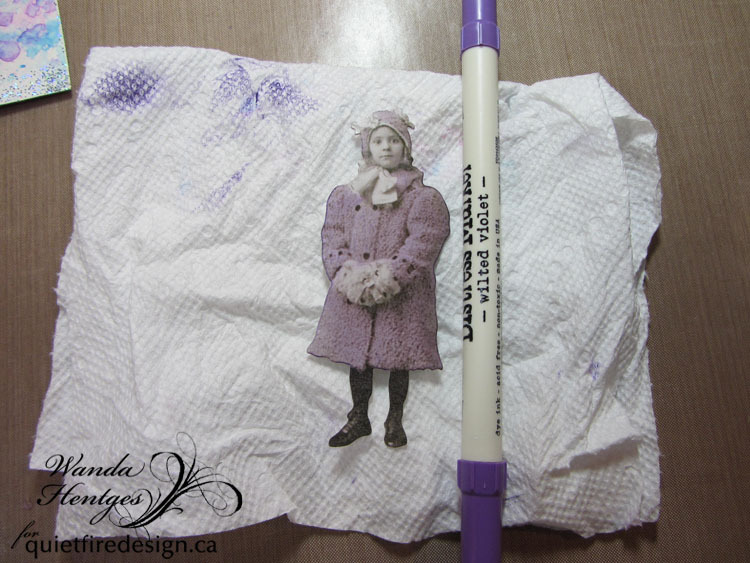 Colour the images with markers. 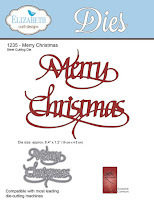 Die cut Merry Christmas from cardstock with Clear Double Sided Adhesive on the front of the cardstock. 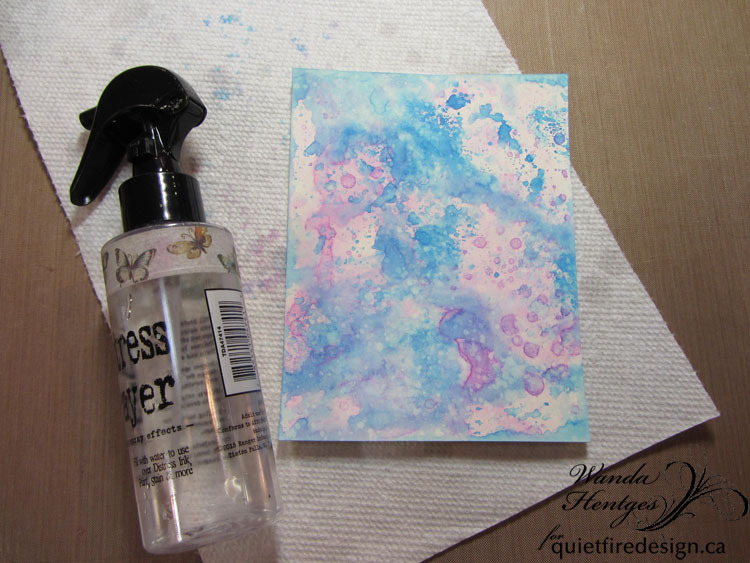 Remove the release paper and apply glitter. Polish glitter with your finger to bring out the sparkle. 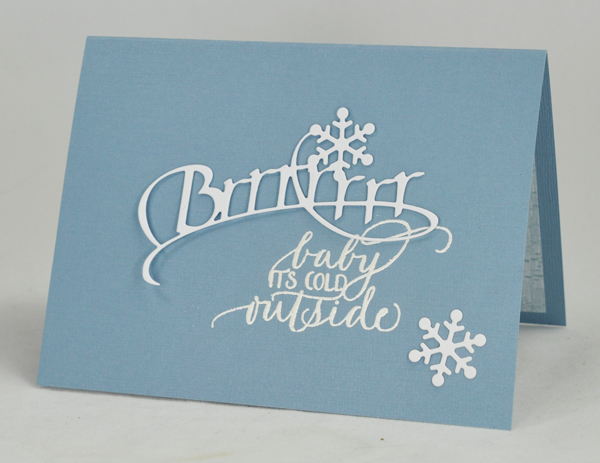 Die cut Brrrrrr once from white cardstock and the extra snowflake multiple times from white and blue cardstock. I cut 7 in total. Tape snowflake side of the Leaf & Snowflake stencil down across the top of the patterned paper with removable tape and apply embossing paste with a spatula. Carefully roll up the stencils and wash with water. Allow the paste to dry before continuing. 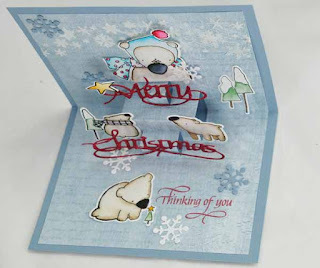 Assemble the card as shown or move the critters around where they please you most! Attach the large bear with foam adhesive to add even more depth. Much as it pains me, you will have to do some surgery on the bottom flourish on Christmas. 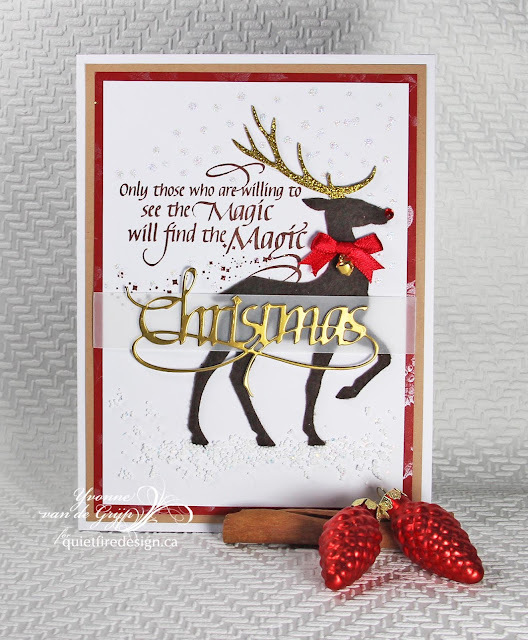 You need a bit more surface area than is available when the flourish is full size, so trim the bottom bit of the flourish with scissors or a craft knife. Make sure you have at least two points (or one long bit) to adhere the words to the pop up steps otherwise the words might want to twist. 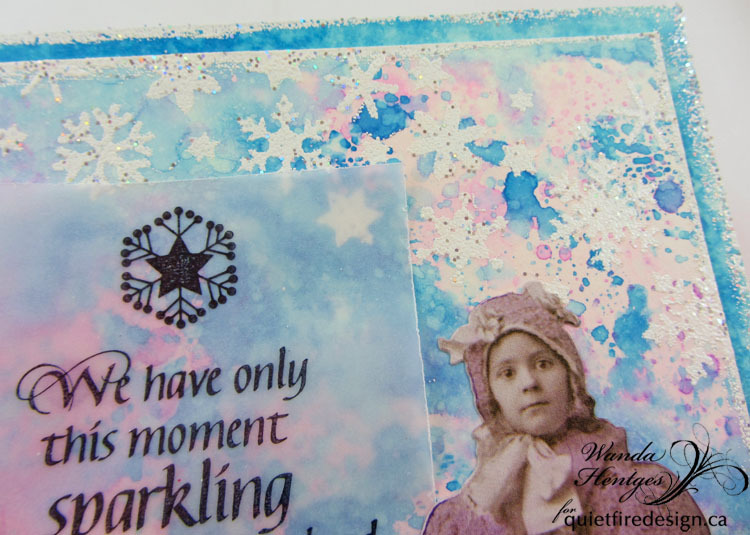 Stamp Thinking of You with Pearlescent Poppy ink as shown. 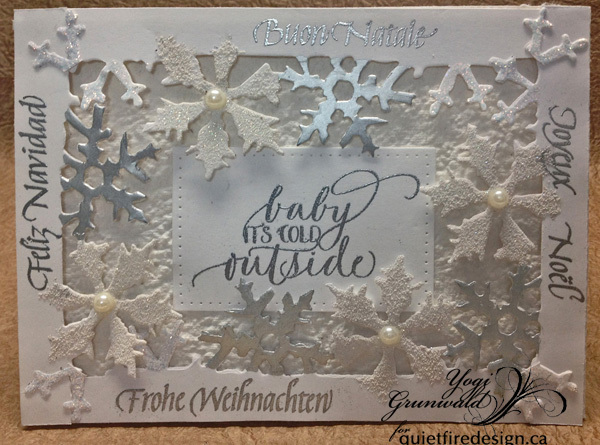 On the outside of the card base, stamp Baby It's Cold Outside and thermal emboss in white. Tape the pop up assembly to the card base making sure you do not apply adhesive under the pop up elements - or they'll have a hard time popping! Adhere Brrrrrrr to the card front and adhere the snowflakes as desired. Enjoy your creation! Now, what can you do next with the General Pop Ups? I see balloons and Happy Birthday, or some of Susan Tierney-Cockburn's flower with Season's Greetings for a completely different look. The list is fun and endless! Hello there on this Monday!! For those of you in the US we have Thanksgiving this week. 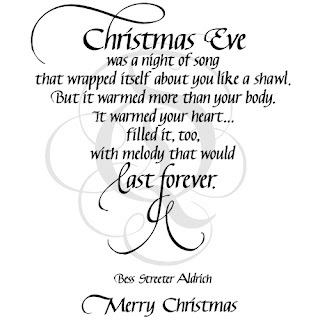 I hope yours is filled with love and family!! 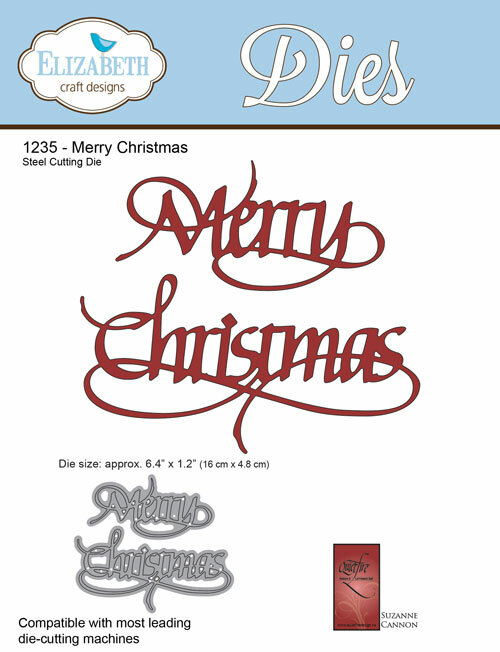 If you hadn't heard, Quietfire Design has new stamps!! Woo-Hoo!! You can find them all in the What's New Category on the website. 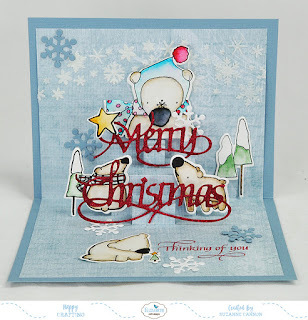 I used one of them on this wintry card, We Have Only This Moment. It's a beautiful stamp with a wonderful message. It's good to look ahead and make plans but we can only be sure of this moment and we don't want to miss it!! I've taken some step out pictures. 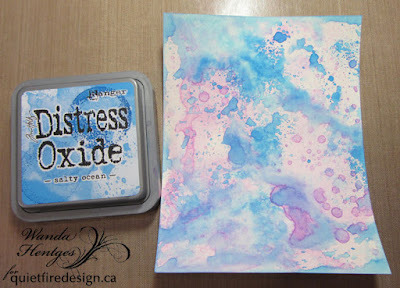 Distress Oxide Inks have been used to create my panels. For the main panel I thought I'd layer my colors one at a time rather than do them together. 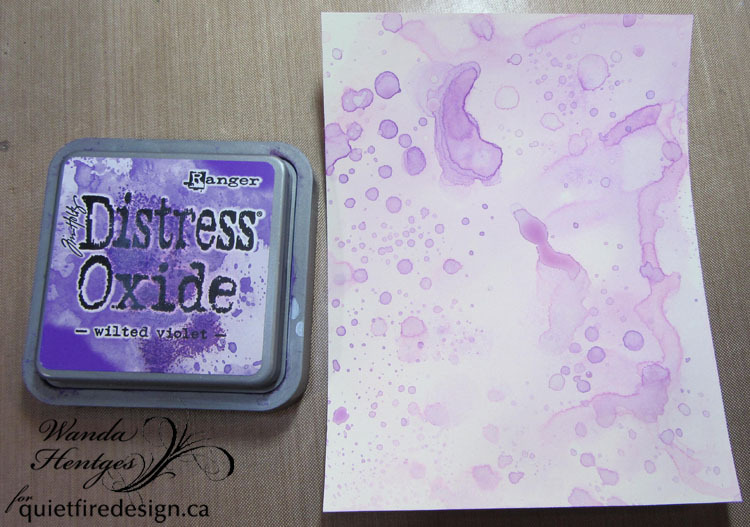 I started with Wilted Violet on my craft sheet sprayed with a lot of water, dipped my paper in and dried it. Next I used Salty Ocean with not quite as much water. I then did a layer of Picket Fence but forgot to take that picture. You really don't see the white of the picket fence. It just kind of softens/lightens some areas and I thought it worked well here for that more wintry feel. After drying it, I then lightly sprayed water onto the panel, blotted it and dried it again. This created lots of little dots that looked like falling snow. 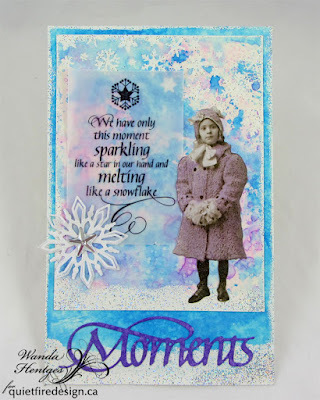 I used the A Way With Stencils Leaf and Snowflake Spray stencil along with Versamark Ink and Snowflake Sparkle Embossing powder. I inked through the stencil, removed the stencil, added the embossing powder and heated it. 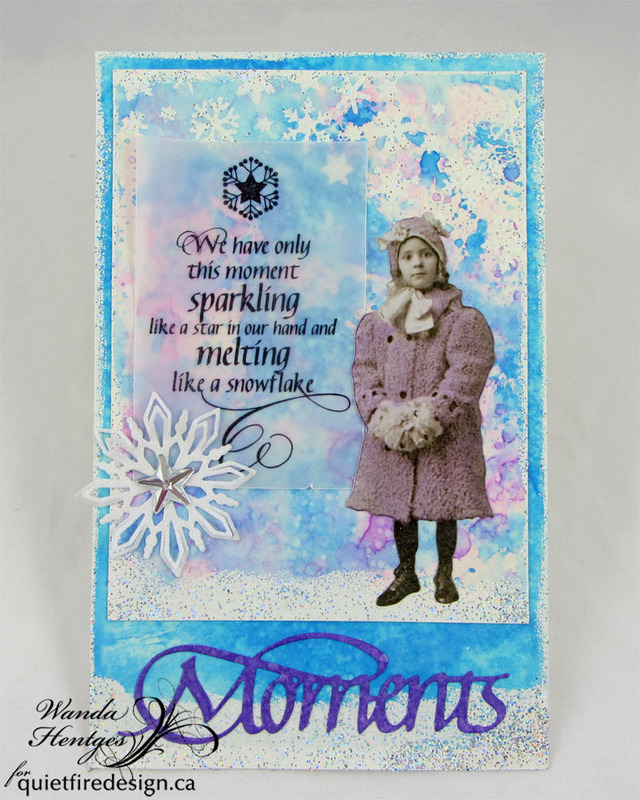 I then added ink and embossing powder around the edges creating a thicker area along the bottom so it looks like a layer of snow on the ground. I chose one of the Tim Holtz Christmas Paper Dolls tinting it with Distress Marker Wilted Violet by coloring on the girl and then blotting/rubbing off the excess with a paper towel. I stamped the quote onto vellum with Archival Ink Jet Black, trimmed it to size, and attached it to the panel by putting a drop of glue behind the center of the snowflake at the top and also gluing the girl over the edge a bit and then adding a die cut snowflake over another corner. The snowflake is an Elizabeth Craft Designs die. 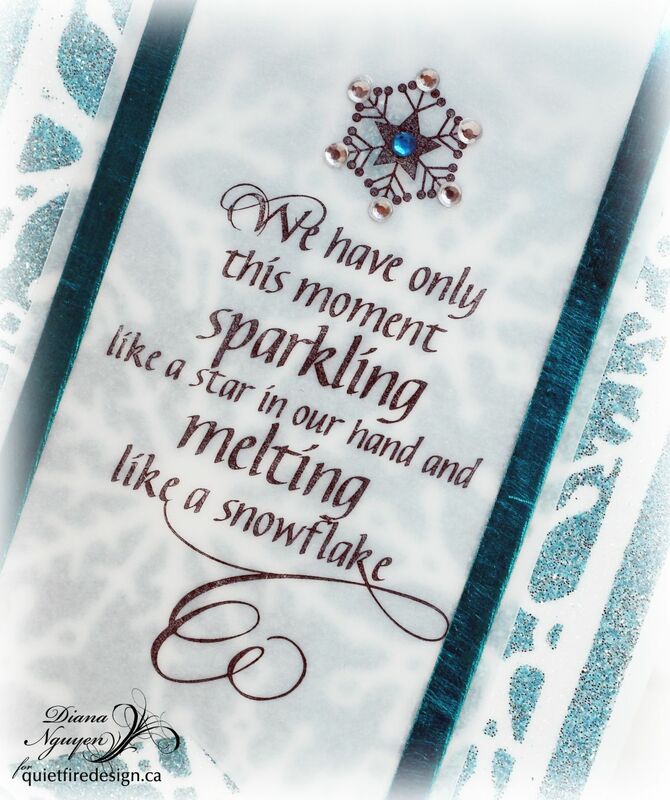 I added double sided tape to the top of a piece of white cardstock, cut the snowflake, removed the liner of the tape and glittered the snowflake with Microfine Glitter Cool Diamond. 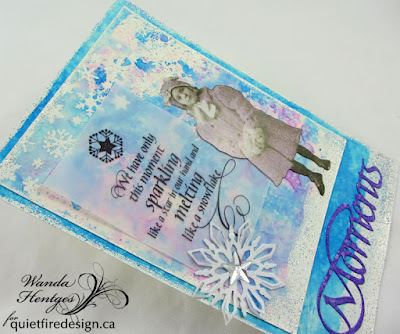 In the center of the snowflake I added a Tim Holtz Mirrored Star. The base panel is colored with Distress Oxide Salty Ocean. Again I used Versamark Ink and Snowflake Sparkle Embossing Powder around the edges and then wider at the bottom. 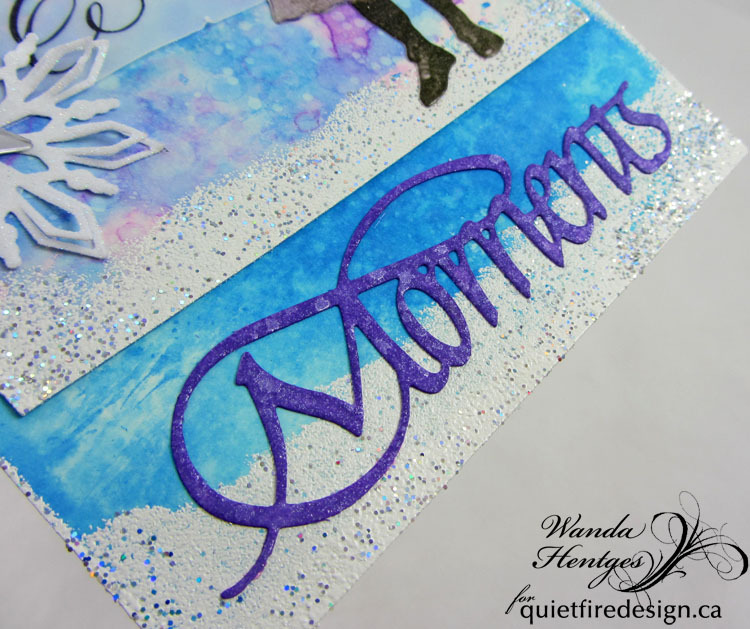 Finally I die cut the word Moments from Distress Mixed Media Heavy Card, inked it with Distress Oxide Wilted Violet, sprayed it with water, dried it, sprayed it with Mica Spray Pearl (Ranger - Wendy Vecchi) and attached it to the panel. I hope you've enjoyed today's project!!! 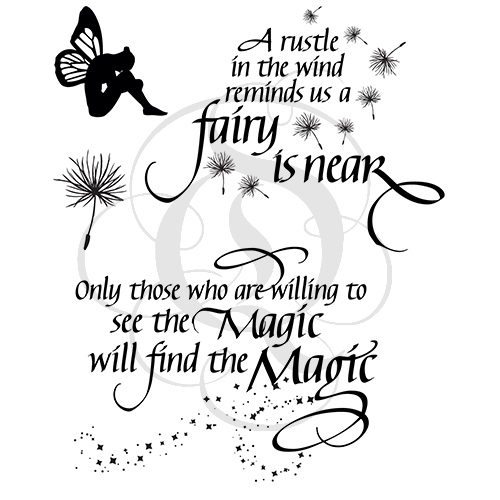 Have a wonderful week!!! Call me a lazy crafter, but I created the side step card using the Sizzix Framelits die set, Hearts Step ups. (I picked up mine at Michaels.) 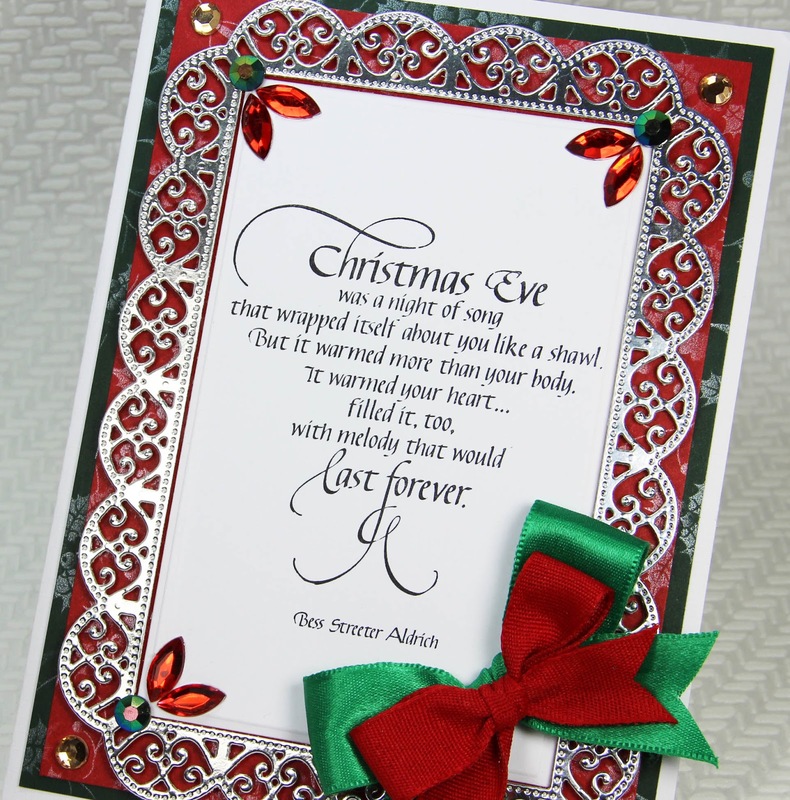 After it was die cut, I bent the die cut hearts down- but you do not need to do this. The gorgeous sentiment was stamped onto Graphic 45 paper using Jet Black Archival Ink and cut to size. 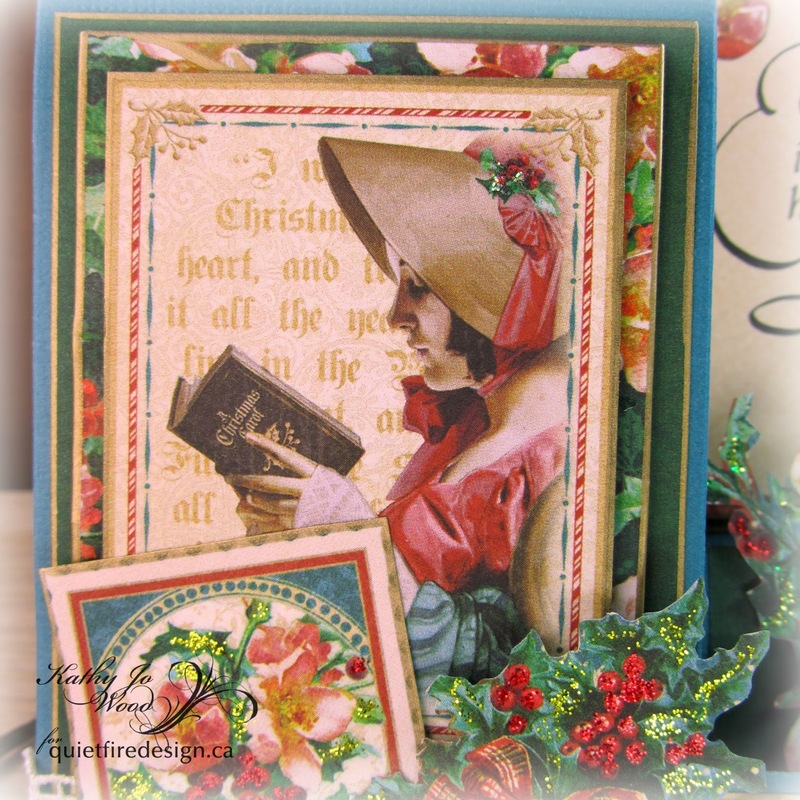 I am so happy with the finished card! 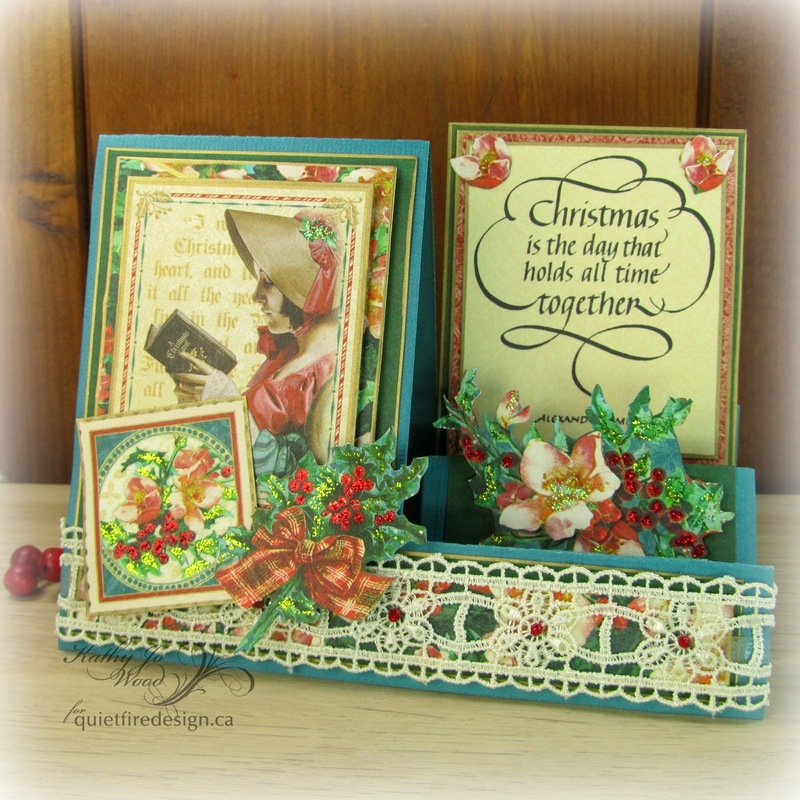 The quote is beautifully timeless...Suzanne creates the most stunning stamps and dies! Thanks for stopping by! I do hope you enjoyed the card! 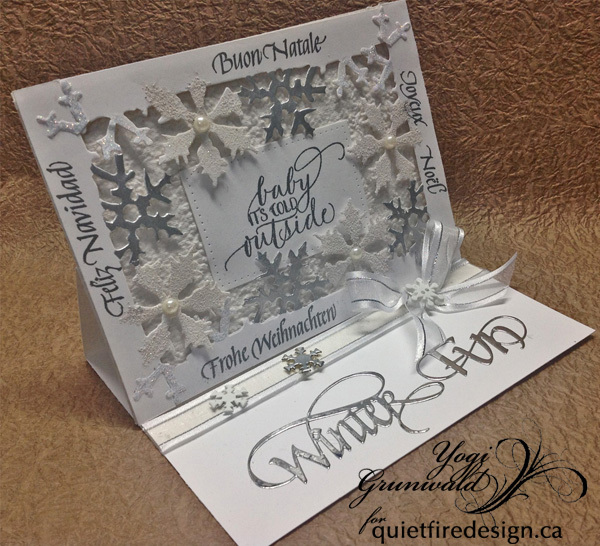 It's Yogi here today with a snowflake framed easel card white on white - not my usual colorful self... I really had to concentrate not to add color... I started playing with Tim's Bigz edger die "Snow Flurries" and the next thing I knew, I created a frame... and the rest just evolved... If you don't have this die, any edger die should work. Stamped the quote using Versamark on white cardstock and embossed with silver embossing powder. Die cut using Elizabeth Craft Designs "Stitched Rectangles" and adhered to front. Die cut the snowflake pieces from white cardstock. 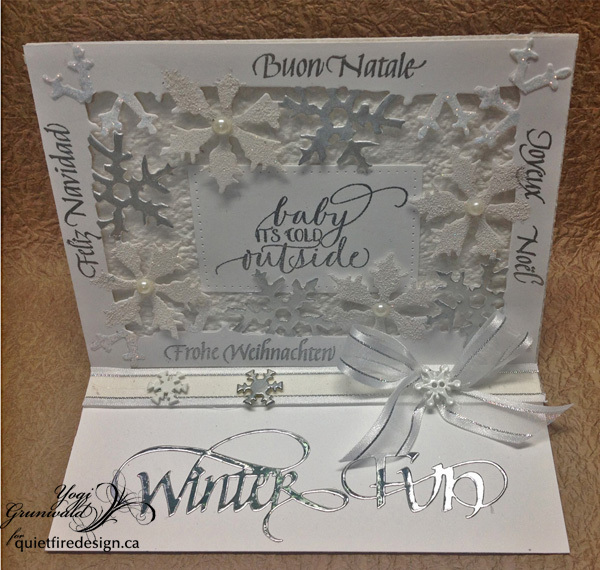 Inked the largest snowflake (using the negative die cut piece as a stencil for the bottom legs of the snowflake) with Versamark and embossed with Emerald Creek "Soft Fallen Snow" (again more texture). 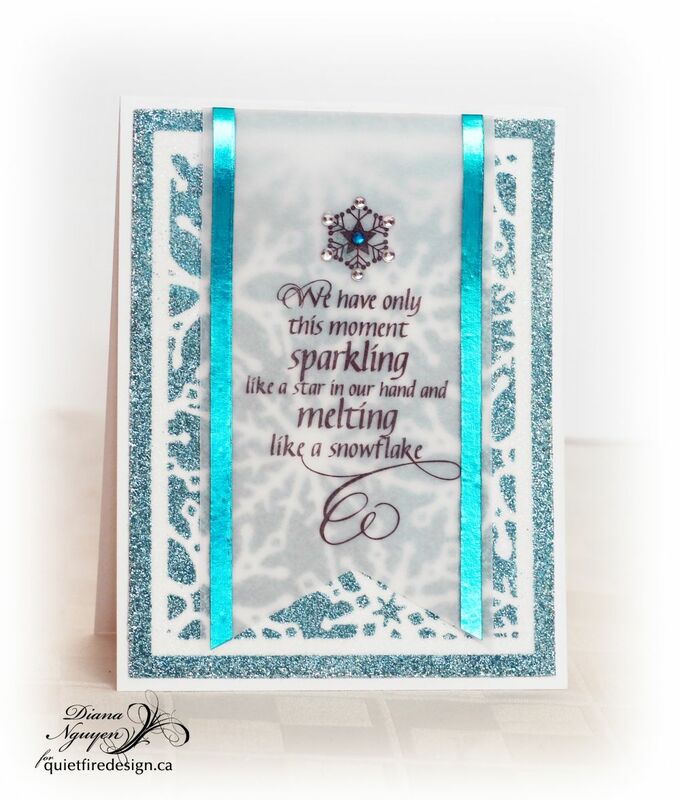 Colored the other large snowflake with a Krylon silver leafing pen. 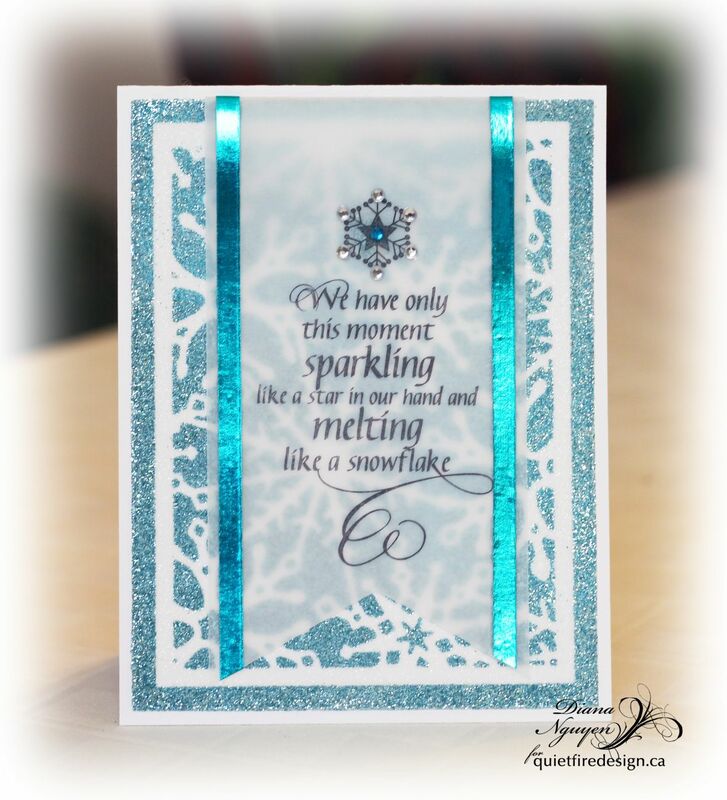 Applied Quickie glue pen on the small snowflake pieces and sprinkled with Stickles dry glitter "Diamond". Trimmed off some of the little snowflake legs where they overlapped when forming the frame and adhered them to mask the frame joins. Adhered the pieces together to create the frame. 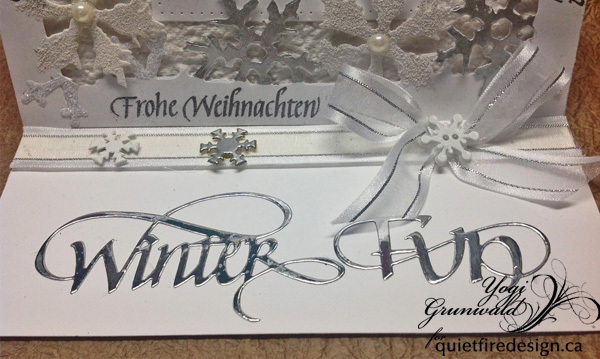 Stamped the Xmas sentiments using the Versamark and embossed with silver embossing powder. Adhered to front with 3D foam tape. Added white pearls to some of the snowflakes. On the floor: adhered a piece of 3D thick foam to a white/silver gauze ribbon and adhered to floor to act as my stopper. Tied and adhered the bow adding a white snowflake button. 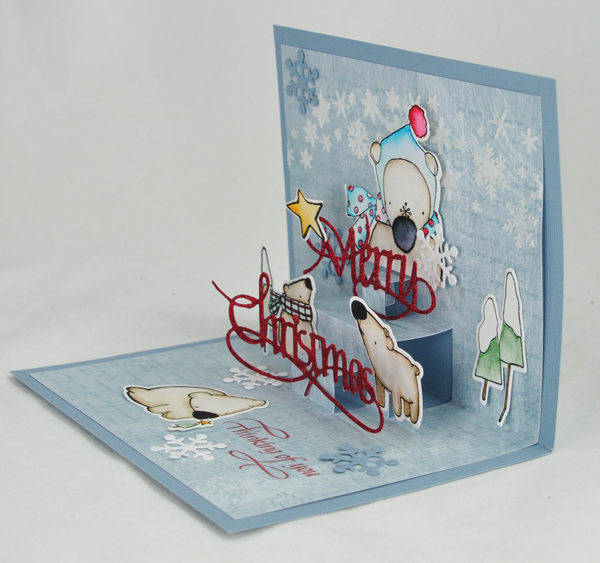 Die cut the "Winter Fun" from DoCrafts silver mirror cardstock and adhered to floor. Adhered a piece of white gauze ribbon with 3D foam tape to act as my stopper. Tied a large bow and added a snowflake button. Added a couple snowflake brads. 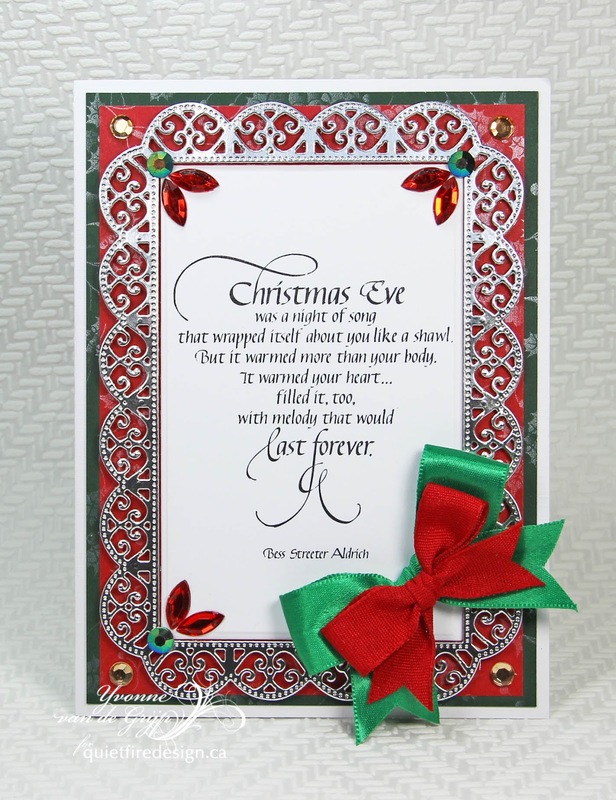 Yvonne here sharing a Christmas card. For me Christmas has that magical feeling and I love theglitter that comes along with that. 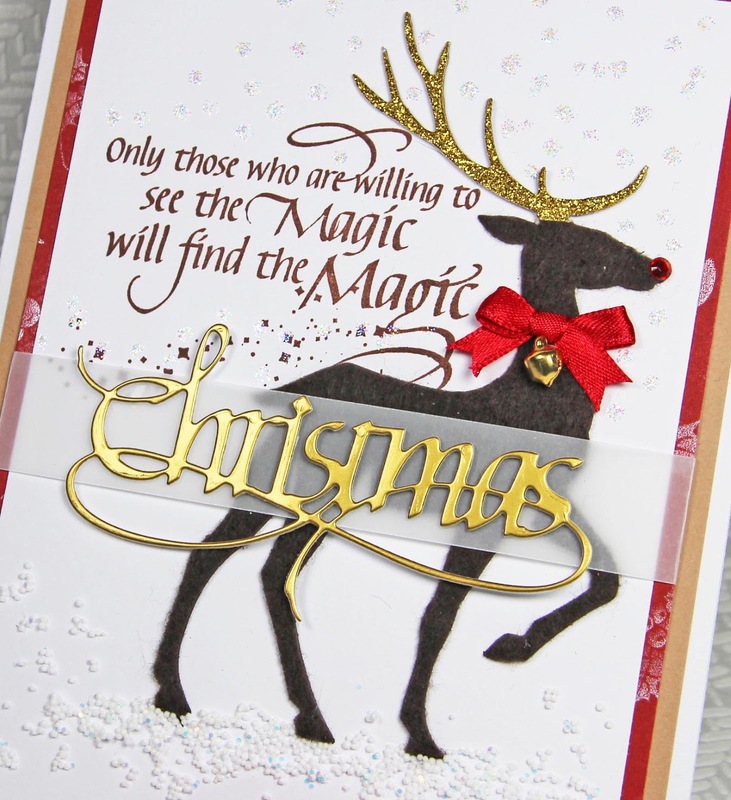 stamping tool, Glue pen, Self-adhesive tape.